It’s Pollen and Allergy Season. Are you sneezing? 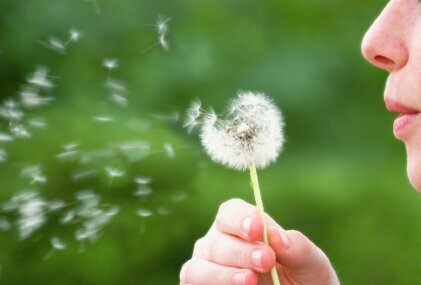 This article discusses pollen and allergy season and ways to ease your symptoms, like sneezing, naturally. While the flowers and warmer temps are welcome signs of spring, sneezing, stuffy noses and watery eyes are mainstays of the season you could probably do without. Yes, pollen and all of their allergy-aggravating friends are back! Try these simple, natural ways to leave allergies—and all the runny noses, dry eyes and wheezing—in the dust. Fight back with folic acid! People with high levels of folic acid experience fewer allergies, according to the Journal of Allergy and Clinical Immunology. Folic acid may help regulate the immune system’s response to allergens. Eating more whole-grain breads and legumes, both great sources of the nutrient, may help you tuck away those tissues. Once a week, scrub down the house with hypoallergenic, fragrance-free cleaners and wash your bed sheets in hot water (130 degrees) to kill dust mites and banish pollen. Be sure to choose impenetrable mattress, pillow and comforter covers. Finally, make sure your vacuum has a HEPA filter, which will trap dust and pollen. Choose one labeled “true” or “absolute” to get the job done right. Track pollen counts at Pollen.com and plan on closing your windows and turning on your air conditioner or dehumidifier to keep out allergens when numbers are skyrocketing. On windy days, or a few days following high winds, pollen count is high because pollen has been spread throughout the air, and mold spore counts can be high after a heavy rain. You may want to consider moving your jog from the park to the gym on those days. Your treads can track in pollen, grass, mold and other allergens, so check them at your door when you come home. You’ll also have much less dirt in the house! Lucky may be cute and loving, but he is also a host for allergy inducers like pollen, which you breathe right in when you pat, hug and play with him. After a walk or backyard playtime, wipe down your “best” friend with a damp towel before letting him in the house, You’ll both be healthier for it! Morning dampness increases mold counts in the air and early afternoon temperatures cause plants to open up and release more pollen, so the best time for hitting the park is at dusk rather than during daylight hours. Wasabi and cayenne pepper can cause your nose to run, which, while annoying, serves to flush out allergens. Turmeric acts as a natural inflammatory, stifling allergy symptoms. Have an extra smidge of the green stuff with your sushi to say “bye-bye” to sinus aggravation this time of year, and be free with the cayenne pepper in chicken dishes and turmeric in curry dishes. The omega-3 fatty acids in salmon, sardines, herring, cod and mackerel also have anti-inflammatory powers. Eat up, and breathe easier, too. Allergists say the small gadget, which resembles Aladdin’s lamp, is a great way to clear out pollen particles. To use it, fill it with lukewarm, lightly salted water. Tilt your head to one side and slowly pour the water into the higher nostril; breathe through your mouth as the water travels back out the opposite nostril. It may not be pretty, but neither are watery eyes and red noses! Find one at your local health food store or pharmacy, and use it over the kitchen sink or tub to prevent a mess. Feel tip-top when you travel by choosing a hypoallergenic hotel room free of up to 98% of bacteria and cleared of allergens from all surfaces, fabrics and airflow. Find allergy-free accommodations at PureRoom.com. Kissing for half an hour may provide relief from hay fever, a study in the Journal of Psychosomatic Research showed. Whatever the reason, grab your sweetie and give those allergies the kiss-off! Note that a healthy dog could benefit from natural remedies in the same way a human takes a multi-vitamin or drinks cranberry juice. Natural products have properties which can provided an added level of support. They are not a substitute for conventional medicine, but can help to keep away from circumstances where conventional medicine may be needed.